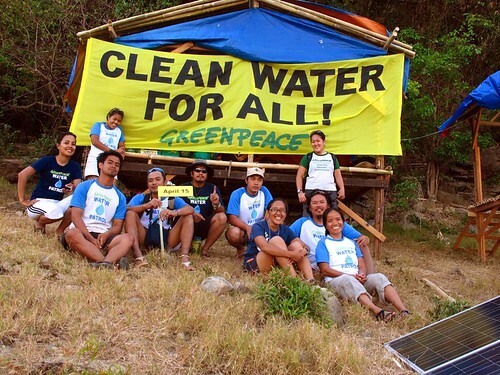 It’s the third day here at the Greenpeace Water Watch Camp in Angat Dam. 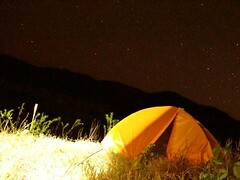 The night before had been a very clear, starry evening, unlike the previous drizzly night, but the day saw a spectacularly hot summer sun alternating with windy downpours – it was as if Mother Nature herself was showing the classic symptoms of someone having a fever. 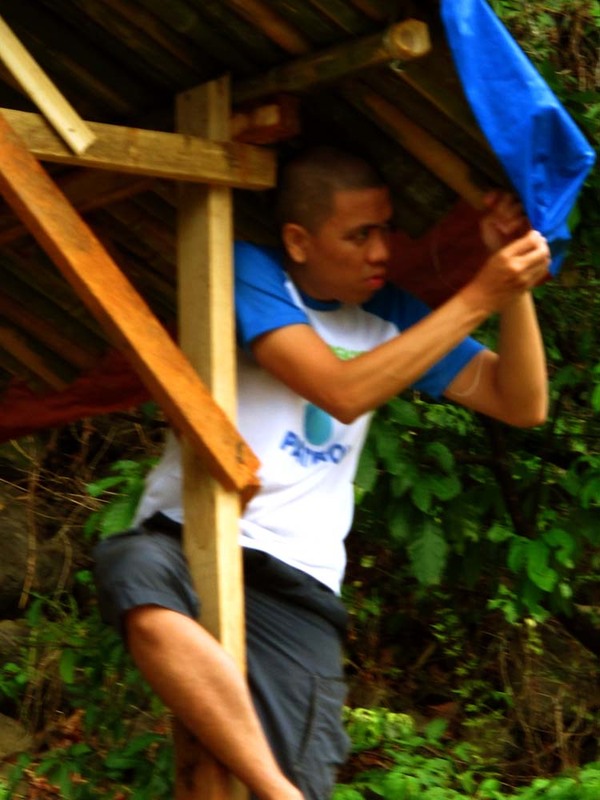 One of the volunteers waterproofing the camp. Early this morning our sleep was cut short by what started out as a drizzle of rain that suddenly became a shower that caught us all by surprise. Our day started with putting things under the makeshift shed that was hastily created to waterproof our sleep area as well as our electronic equipment. Everyone scrambled to put up some tarps and waterproof our gear and equipment. In the middle of the rain some of us tried putting up a rain gauge to measure the precipitation levels. 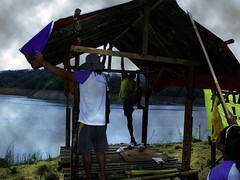 Greenpeace volunteers waterproofing the camp. The first night at the Greenpeace Water Watch camp, we were met by light drizzling, which eventually turned into a considerable downpour at around 5:00AM and lasted a bit less than two hours. Geologist C. P. David, who was kind enough to offer his expertise in setting up instruments to measure climate-related indicators such as precipitation and water level here in Angat Dam, is scheduled to arrive a bit later this morning. Luckily, he already quickly briefed some of us about how a rain gauge works a few days before we set off for Angat, and we had put one up right on the camp. 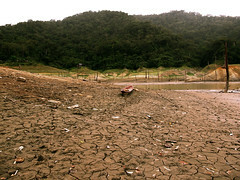 The reading showed up as one millimetre rainfall. 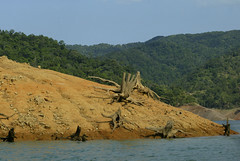 Looking at our water level markers, it seemed to have zero effect on the receding levels in Angat. About a foot lower (we will be making more accurate measurements from the markers in three days), it still seemed to confirm the trending estimated for the past couple of weeks by the Angat Watershed Area Team (AWAT) – around a meter lower every 3-4 days.